This would require the completion of a high school diploma and a police academy training program. The time required to complete the police academy varies according to state. For instance, the San Jose Police Academy in California has a 26-week long program; the Dallas Police Basic Training Academy has a 36-week long training program; the Phoenix Police Department has a 20-week long training process and so on. On average, the police academy training would range between four weeks to 6 months, according to the US Bureau of Labor Statistics. This time range does not include any field training that the recruits might be required to complete. In some cases, particular candidates might be needed to complete additional training time, if the supervisors consider it necessary. Some law enforcement departments may require candidates to hold an undergraduate degree. This could be a 2-year long associate degree or a four year long bachelor’s degree program. Coursework in these programs would involve subjects such as forensics, criminal theory, the juvenile justice system, basic defense tactics and patrol operations. To be eligible to hold the sheriff’s office, you will be required to gain some experience first. The majority of jurisdictions require potential sheriffs to have at least one to five years or previous experience in criminal justice or any law enforcement related field. This step would require extensive time investment. The official process will require getting signatures from the public and filing of some paperwork which might not take time as such – the election campaigning and fundraising is what will take time. Candidates would be raising funds for the campaigns and will need to follow a certain set of campaigning rules set by the local authorities. The amount of time this step takes will depend on the county’s application for candidacy deadline and how much time you have to raise funds and campaign. Make sure you check the deadline to apply for sheriff’s office in your county. Needless to say, you will be required to submit all finances pertaining to your campaign. After getting the majority of the vote in the elections, the newly appointed sheriff must take an oath. Even though the duration of holding sheriff’s office varies in some states, it is generally considered to be a four-year long term. The time spent on each of these steps may vary from candidate to candidate as well. If you have already done a bachelor’s degree in a related subject at some point in your life, you would be able move to the next step straight away. Make sure you check all the requirements in detail before beginning the application process. 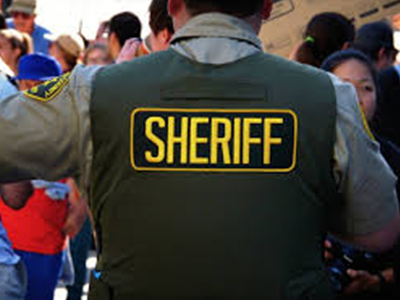 You may visit your county’s sheriff department’s official website for detailed information about deadlines, qualifications, requirements and salary structures. The job of a sheriff involves dealing with a lot of stressful situations and dangers; therefore becoming a sheriff is not easy. The process to become one is detailed and extensive – so you will need a substantial amount of time and effort investment. If your application is approved and all documentation is in order, you will be able to conduct a campaign and raise funds from the public. If elected, you will take an oath and assume office for duration of four years.